If you’re looking for a new job, the prospect of finding work and updating your CV, LinkedIn and various other platforms can be demotivating. Job-hunting is exhausting, especially if you’re juggling it alongside work, studying and raising a family. An increasing number of us are seeking the help of recruitment agencies for extra support. But what value does a credible agency add? How do job-seekers benefit? And can it really help accelerate your job search? What are the main benefits for job-seekers? There are a number of benefits to signing up with a recruitment agency. Firstly, it can alleviate some of the pressure; a good consultant is proactive, hardworking, efficient and will match you with suitable roles and crucially tell you about roles that aren’t visible yet. Recruitment agencies are there to ensure job-seekers achieve their career goals by placing them in appropriate roles. A good agency will benchmark their candidates against others and suggest skills that might increase their chances of employment. Most recruiters have in-depth knowledge of a particular employment sector or industry, whether that’s creative industries such as publishing and marketing, or operation-led roles, such as warehousing and logistics. Finally, if you’re represented by a credible agency, then it’ll work in your favour as it’ll give you a competitive advantage. If the agency and client have a good working relationship, then you already stand a far greater chance than you would as a stand-alone candidate, most notably because the recruiter will have a huge amount of inside knowledge about the client that they can provide and by providing specific pre- and post-interview feedback. It’s also worth noting that if your CV doesn’t jump off the page, a good recruiter may secure an interview while your CV alone may not have. How can I find the right recruitment agency? If you’re considering signing up to an agency, it’s important to do your research first. Shop around and try to meet the recruiter face-to-face. Ask plenty of questions about their client-base and the types of roles they advertise. Most reputable agencies pre-screen their candidates. This tends to be an informal conversation about your career goals and work experience. It may include some basic competency tests to gauge your level and suitability for specific roles. The recruiter will ask for specific information regarding the type of role you’re looking for. It’s important to consider your answers beforehand, as this will improve your chances of being matched with the right role. Finally, be ready for a good recruiter to question your motivation to move roles. Will a recruitment agency improve my chances of employment? Recruitment agencies enable candidates to easily access a wide range of clients in their particular industry, gain interviews more easily and be informed about roles that aren’t placed into the mainstream. Some agencies work with small-to-medium enterprises (SMEs) and therefore can have access to local business opportunities. Whereas other agencies may have a broader client-base that covers a number of areas and regions. Once you’ve met with a consultant and discussed your options, they might suggest some ‘next-steps’ to help you improve your chances of getting work. This may include CV tips, developing skills or gaining voluntary experience (if you’re considering a career change) or remaining where you are! They will know if your situation is actually a good one. Remember: consultants will only put you forward for a role if your application is strong enough and covers all the key areas and their clients’ demands and expectations will often change through the process. Every time a consultant recommends a candidate, their reputation is at stake. What if I’ve been out of work? If you’ve been out of work, this can impact your self-confidence as an individual. Consultants understand this. It’s their job to offer encouragement and support throughout the process. Most agencies offer professional guidance and practical suggestions to help you get back to work. This may include interview tips, help with CV-writing and general advice when it comes to understanding a specific industry. For more tips, please see our previous blog post on writing a CV when you have been out of work. If you’re considering a career change, consultants may look at your job history and suggest an appropriate field or role. Most skills are transferrable and can be utilised in a number of ways. If you have a particular role in mind, then your consultant should be able to advise on this and suggest any skills that are vital for the position. You should then look into gaining these skills, be it through work experience, internships, online tutorials, or additional study. If you’re interested in a new role, we are actively recruiting and need candidates for both permanent and temporary roles across Milton Keynes and Northampton. 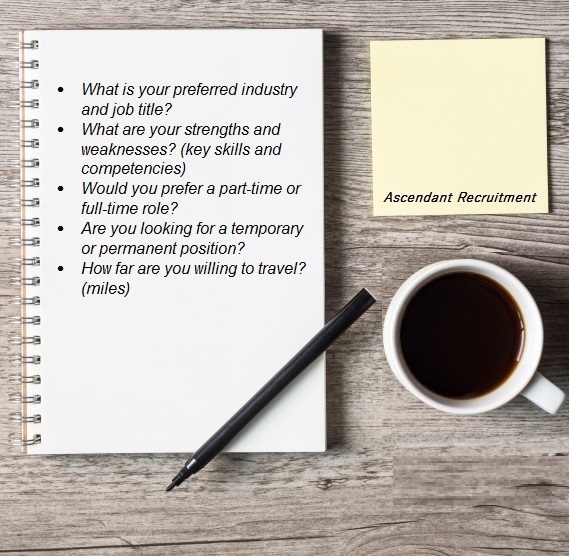 Please email your CV over to info@ascendantrecruitment.co.uk or call the team on 01908 270200 (Milton Keynes) or 01604 439380 (Northampton).